You can shave off 100 calories by eating half a bagel, half a slice of bread, half a piece of cheese, or half a cookie. If you learn to do without those extra few calories each day until it becomes a habit, the reading on your scale with reward you. 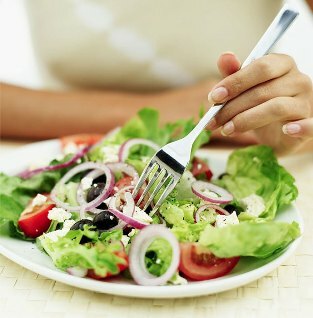 You can whittle away your waistline by downsizing your dinner plates. The size of dinner plates and the amount of food they hold has steadily increased over the years. Not too long ago, dinner at home came on a modest 10-inch plate. Today you’re more likely to find one that measures a hefty 12 inches. The standard restaurant dinner plate used to be 10 1/2 inches; now you can find them as large as 12 1/2 inches. So, use a smaller plate for dinner at home. You will eat less but your plate will appear to be full. When you eat out, share an entree with a dining partner. Researchers at South Carolina’s Clemson University questioned 300 chefs about how much food they served. Three out of four chefs thought they served regular portions, but the amount of steak and pasta they heaped on plates was two to four times more than the recommended serving sizes. The chefs based their decisions on how the food looked on the plate and what the customers expected. But if you ask the waiter to split the entree onto two plates, you may not even notice you’ve got less than that giant portion—especially if you order a hot soup first. Studies have shown people eat less when they eat soup before a meal. Add some zing to your food with hot peppers. Capsaicin, the natural substance that gives a spicy kick to hot peppers, revs up the metabolism and helps the body burn calories. In one laboratory study, researchers found capsaicin actually prevents fat cells from developing. Drink your water iced. According to Rebecca Thompson-Flagg of American Physical Society, “Your body has to spend energy to warm the water, so you’ll burn some extra calories.” How many? About 8 calories for an 8-ounce glass of water. Not all that many, but still . . .
Use chopsticks instead of a fork. It takes about 20 minutes for your brain to get the message that you’ve had enough to eat. If you race through your meal, you’ll chow down extra calories while your body is figuring out whether it’s still hungry. To slow down your eating pace, try using chopsticks instead of a fork. Not only will you most likely eat more slowly, you’ll also take smaller bites. To save the calories packed in a can of sugar-sweetened soda, people often switch to diet soft drinks. But those drinks may be playing a trick on you. Some research suggests that drinking diet beverages is linked with putting on weight. David Ludwig, M.D., of Harvard University recommends using diet drinks as a short-term transition from highly sugared beverages to minimally sweetened ones, such as a cup of coffee or tea with a teaspoon or two of sugar. Walk! Slip on your sneakers and start walking—but first clip a pedometer to your waistband. This simple fitness tool can motivate people to walk more. “Men and women who wear a pedometer and keep track of how much they walk take an additional 2,000 steps each day,” says physiologist Barry Franklin of William Beaumont Hospital in Royal Oak, Mich. Most people believe they walk a whole lot more than they do, so before you start, estimate your daily steps. Then use the pedometer and log your number in a notebook each evening. Work up to 10,000 steps each day, about five miles. Big City Living. People who live in large cities tend to weigh less than those in suburbs or the country. 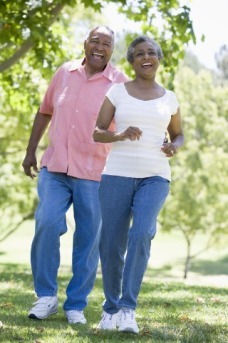 One reason, health experts say, is all the walking they do in their daily lives. So pretend like you’re a New Yorker—walk to the farmer’s market, stroll to the movie theater, take a stylish walk with your dog. I really enjoyed your website. thereisso much information for a middle-aged person to receive. I am impressed and proud of you my brother….